Facts and Information about RMS Titanic's sister ships RMS Olympic & HMHS Britannic. What were the similarities, differences and where are they now? Great information for teachers, students and historians. A ship as grand Titanic was simply too expensive to be built as a one off project, and as a result she had two sister ships which was hoped would form the front line of White Star Lines Transatlantic route for then next two decades. These class of liners were named the "Olympic" class. RMS Olympic was constructed before Titanic, and “Britannic” which was built in the aftermath of the Disaster. Similar to Titanic, Olympic was designed by Thomas Andrews and literally built side by side to Titanic in the mammoth Gantries of Harland & Wolff's shipyards. 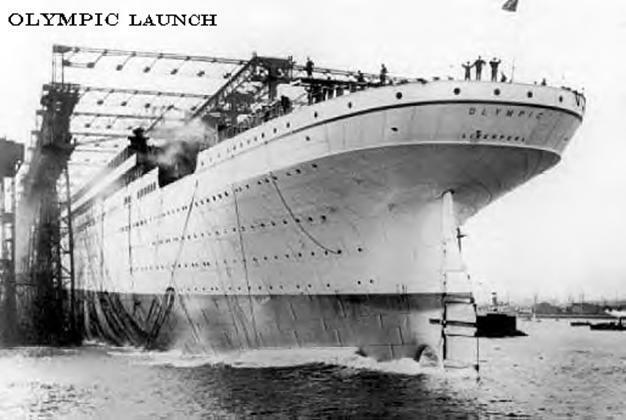 Olympic was completed and launched almost exactly twelve months before her infamous sister ship on September 20, 1910 and she had a successful maiden voyage on June 14, 1911. 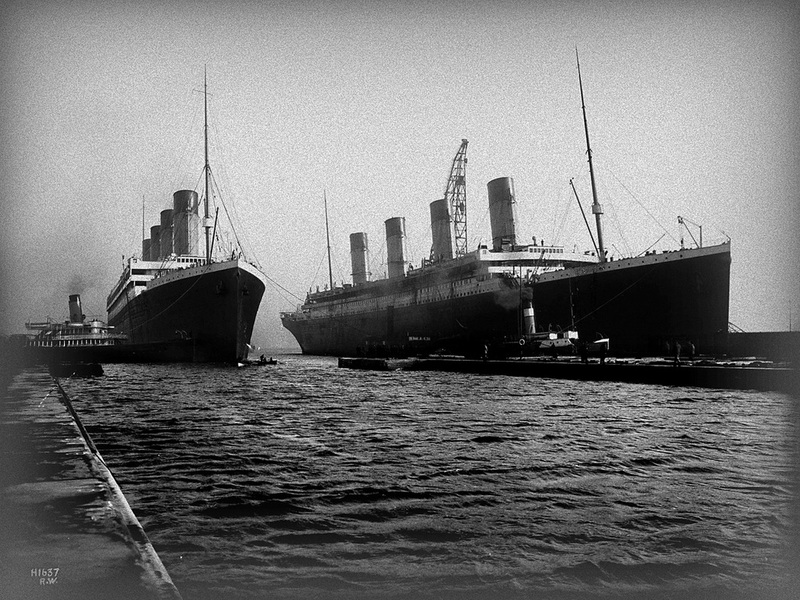 Strangely, for all the fanfare Titanic receives for its superiority to other liners of her day it is amazing how similar the Olympic and Titanic are. Titanic was fractionally larger than the Olympic with best estimates being only some 3 inches favouring the Titanic but over 1000 tonnes heavier in gross tonnage than Olympic. Well-received by patrons, the Olympic found minor tragedy when it was struck by the military cruiser the HMS Hawke. She returned to Belfast and was repaired using parts from the Titanic, which was currently under construction. Olympic was fitted out for a different clientele to that of Titanic and had very little of the lavish affection to detail, craftsmanship and opulence that Titanic was to later offer. In saying this, Olympic was a grand ship for her era and had many cutting edge features which set her above her peers. 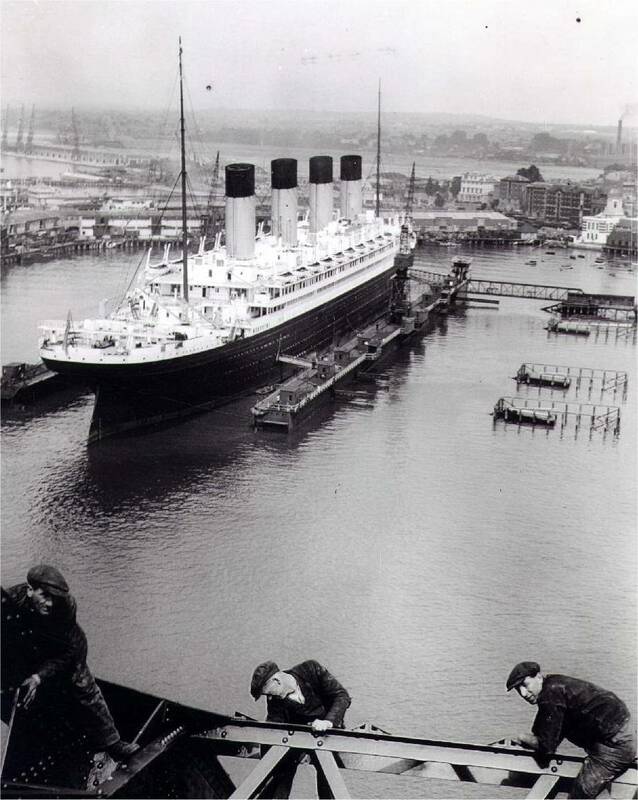 After the Titanic disaster, Olympic revisited the Harland and Wolff dry-dock for various safety improvements including lifeboats for all aboard, and in October 1912 Olympic returned to Belfast again for installation of an inner watertight skin. In October of 1914, Olympic assisted the sinking British battleship Audacious and conducted a daring at-sea rescue. Olympic the served during the remainder of the first world war as a troop ship carrying Canadians to the European war front. It was during this service that Olympic obtained her nickname "Old Reliable," for her trustworthy service on these troop carrying voyages. It must be remembered that Olympic was also the biggest liner in the world. Until Titanic was launched of course. 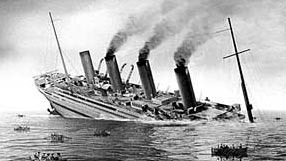 Her most famous wartime moment, and perhaps the most famous moment of all of the Titanic sisters is when the Olympic struck and sank a German submarine, U103. This would prove quite ironic in comparison to the Titanic striking an iceberg in outcome for the liner. RMS Olympic lived up to her nickname of ‘Old reliable” after many years of successful service as a troop ship moving over 120,000 troops from Canada to Europe and surviving 4 submarine attacks. She returned to being a passenger liner for the next two decades with the only blemish in her career being a collision with the lightship Nantucket in heavy fog killing seven people. Olympic was scrapped in 1937 some 2 years after she completed her final voyage on April 12, 1935 which was the anniversary of Titanic's maiden voyage two decades earlier. The Olympic was the first of three sisters and was originally fitted with the various styles and graces found on the Titanic except for the Promenade decks which only ran half length. On her maiden voyage, Bruce Ismay had noticed that the open deck space on B deck was too large and not many passengers were using it. He soon rectified the position by ordering the RMS Titanic's plans to be changed to add more cabins to the promenade deck to create extra passenger space. Most of the Olympics interiors have been well photographed and in fact most books on the subject contain pictures from the Olympic not the Titanic because the Titanic was not in service long enough for the press to gain access to her. Olympic is in Drydock in this photo. The men in foreground exemplify the bravado of the era as they hang onto scaffolding. In many ways the scrapping of Olympic was closure to the tangible life of Titanic. Savvy collectors purchased numerous items from her which are highly sought after today. 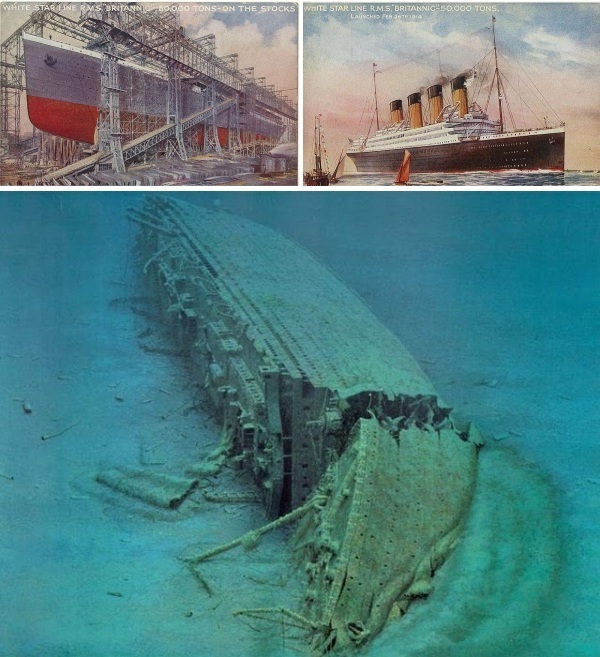 Britannic was built in the shadow of the tragedy of Titanic, this ensured it had all of the safety features her ill-fated sister did not, but she was also subjected to a high level of scrutiny and negativity in the press that both Olympic and Titanic never received. The catch phrase of "The Unsinkable Ship" would haunt White Star Lines forever after. Continuing the growing trend of all three ships. Britannic was the largest of all three liners. She was to be originally called 'Gigantic' but was changed after it was deemed to be too similar in name to Titanic which would have been a marketing suicide. Britannic was refitted as floating hospital for service during world war one. Britannic launched on February 26th 1914, as a passenger liner between Southampton and New York but her course would alter greatly with the outbreak of World War 1. She was requisitioned by the admiralty and officially completed as a hospital ship. The original fixtures and fittings that were to be placed on the Britannic were stored for after the war and were fitted out to resemble a hospital. The first class dining rooms were converted into operating theatres and main wards. B deck would house the medical officers and other staff. The ship was fitted to carry 3,309 people. On December 12th 1915 she was ready for war service. Obviously following the greatest maritime disaster of all time would lead to changes in the construction of Britannic. One major difference was the layout of the lifeboats. She was designed to carry 48 open lifeboats. Forty-six of them would be 34 foot long (making them the largest lifeboats ever placed on a ship before). Two of the 46 would be motor propelled and would carry wireless sets for communications. The other two were 26 foot cutters placed at both sides of the bridge. Britannic would take her maiden voyage as a military vessel to Mudros Greece, and after three trips to the Mediterranean, Britannic was laid up in April 1916 and decommissioned a month later. However, before she was completely refitted for passenger service, she was recalled to hospital ship duty and resumed that service in September. On her third trip after being recalled, she struck a mine off Kea Island on 21 November 1916 and sank 55 minutes later. Various sources give the number of deaths as between 21 and 41; all occurred when two lifeboats were shredded by the ship's still turning propellers. Fortunately, no patients were aboard; the balance of the 1,125 medical staff and crew were rescued.